If you need a dependable range load for your Mosin-Nagant, PSL, or other 7.62x54R rifle, you need this affordable FMJ ammo from Tula. 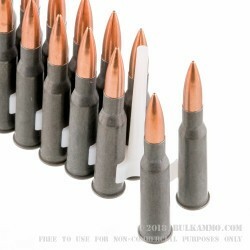 These cartridges come in a bulk priced case of 500 (contains 25 boxes of 20 rounds each) and fire a 148-grain bimetal jacketed bullet at a muzzle velocity of 2,785 feet per second. This ammo is new production and uses non-corrosive Berdan primers, making it a great low-cost alternative to military surplus ammo if you don't like the cleaning requirements of corrosive rounds. Like most Russian-made ammunition, it uses polymer-coated steel cases that, although not reloadable, provide reliable feeding and ejection. No jam. Just consistent performance. Everyone can make an the best round for lots of money. But only some can make it consistent at lowering price. Excellent ammunition for target practice! I purchased a case of 500 rounds for my m91/30 and have been very satisfied with this ammunition so far. Better quality and more consistent grouping than with military surplus ammunition. Shooting from 100 yards I was seeing 2-3 inch groups. This ammunition also feeds much better than milsurp! Every round Ive fired has cycled flawlessly, no sticky bolt. this is the best ammo i found for the money .this is my 4th case and have'nt had a miss fire or jam! 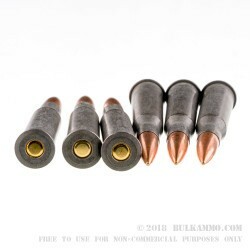 Q: Are these rounds made with a metal core? Are they magnetic? 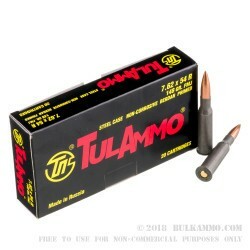 A: This Tula 7.62x54R ammo has a lead core. The jacket is made of mild steel and copper and will attract a magnet. Q: Is this ammunition new production or surplus? A: This Tula ammunition is new production, loaded with non-corrosive primers.